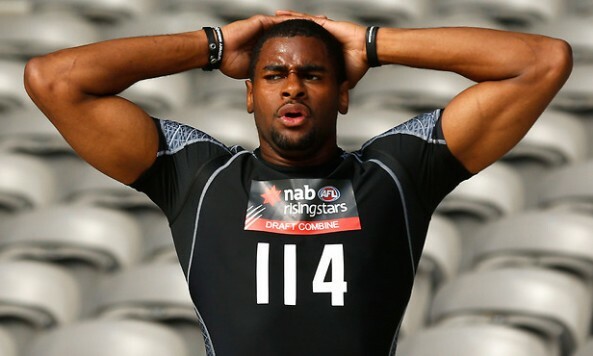 Australian Rules Football club, the North Melbourne Kangaroos, has signed Eric Wallace, an American College basketball player, to a two year contract after he impressed in a 10 day trial and the AFL Draft Combine in October. Wallace is described as a 196cm (6'5"), 102kg (224lb) big man in this article, however his profile at Seattle University lists him as 6'7" and 233lb. It wouldn't be the first known case of "Pacific Shrinkage" however — just ask all of the NBL teams that have brought out imports over the years! Wallace, who also attended Ohio State and DePaul, appears to have been an imposing rebounder and scorer in his collegiate career, playing as a forward. If the North Carolina native makes the senior roster, he will be just the third American to do so. Conversely, a number of Australians have made the leap to America's NFL — with Darren Bennett being the most successful. He has been signed as an international rookie list player. Coach Brad Scott said Wallace's work ethic and athletic ability suggested he was worth taking a chance on. 'Eric has worked extremely hard and proved to us he's willing to do whatever it takes to play AFL football,' Scott said. 'The ovation he received from the playing group when we announced his signing was evidence of how highly regarded Eric already is at our club and the way he has fitted in so easily. This is the latest in a string of cross-code moves in Australian football codes. Some of have been successful, whilst others have been complete failures, as players enter (particularly) AFL with no experience whatsoever of what the sport entails. Time will tell how Wallace's venture pans out.